We’d love your help. Let us know what’s wrong with this preview of Stuck in Neutral by Terry Trueman. Shawn McDaniel is an enigma and a miracle except no one knows it, least of all his father. His life is not what it may seem to anyone looking at him. Not even those who love him best have any idea what he is truly like. In this extraordinary and powerful first novel, the reader learns to look beyond the obvious and finds a character whose spirit is rich beyond imagining and whose story is unforgettable. My life is like one of those "good news-bad news" jokes. Like, "I've got some good news and some bad newswhich do you want first?" I could go on about my good news for hours, but you probably want to hear the punch line, my bad news, right? Well, there isn't that much, really, but what's here is pretty wild. First off, my parents got divorced ten years ago because of me. My being born changed everything for all of us, in every way. My dad didn't divorce my mom, or my sister, Cindy, or my brother, Paulhe divorced me. He couldn't handle my condition, so he had to leave. My condition? Well, that brings us to the guts of my bad news. To ask other readers questions about Stuck in Neutral, please sign up. So, the main question of Shawn's dad is, should he euthanize Shawn to "put him out of his pain", right? But he also has the question, can Shawn feel or think at all? Why does his family never order an EEG? https://en.wikipedia.org/wiki/Electroencephalography Wouldn't that answer the second question, which would certainly influence the first question?? I have to think for a while about how to rate this book. I am definitely adding it to my "most disturbing" list. The plot of this book involves a boy who can remember everything he's ever heard. He's clever and mostly happy and loving, but he's trapped. Trapped inside his body, unable to exercise control over anything but his brain. The book is interesting from the POV aspect, wondering what it would be like to be so intelligent but for everyone else to think you are retarded. To be privy to con I have to think for a while about how to rate this book. I am definitely adding it to my "most disturbing" list. The plot of this book involves a boy who can remember everything he's ever heard. He's clever and mostly happy and loving, but he's trapped. Trapped inside his body, unable to exercise control over anything but his brain. The book is interesting from the POV aspect, wondering what it would be like to be so intelligent but for everyone else to think you are retarded. To be privy to conversations all the time, sometimes even conversations about you, because everyone either forgets you are there or doesn't think enough of you to place a value on your presence. This isn't my review, I'll write more later, but the most disturbing aspect of this book is that the father left the family when Shawn (the boy with cerebral palsy) was 4,because he couldn't handle it and throughout the book, Shawn wonders if his father is going to kill him. (he "loves Shawn too much" so he might have "to end his suffering") It is painful to read a book, knowing what Shawn is thinking, knowing no one else has any clue. It is scary and sad and I'm not sure if I liked this book at all. However, it's definitely unlike anything else I've ever read and it's provocative. This book, Stuck in Neutral, by Terry Trueman is one of the best books that I have ever read. It’s about a teenage boy named Shawn McDaniel. He has cerebral palsy; a condition where you can’t move a muscle in your body and can’t communicate with anyone other than yourself. Shawn can only say things through his thoughts in a first person view. Shawn thinks of himself as dead-like, yet intelligent. Shawn’s dad can’t see him suffering, so he is planning to kill him, but Shawn wishes that he could talk so that he can tell his father that he doesn’t want to die. Hopefully, Shawn's father doesn’t kill him. Sad and worried, Shawn is between a life and death experience. The story has a bunch of twist and turns, that will glue your eyes to the book over and over again until you memorize each page, each word, and each punctuation mark. It is an excellent book. This is a short book, but I still didn't finish it. I was too disturbed by the fact that the real author maybe wanted to kill his own son and was using this novel as a way of working through that. Also, and this is kind of strange, the first few chapters reminded me of Bud, Not Buddy because the narrator in both is a little kid in a terrible situation who's just so darn upbeat about everything. And by "upbeat" I don't mean optimistic, I mean uses a lot of whimsical expression punctuated with ex This is a short book, but I still didn't finish it. I was too disturbed by the fact that the real author maybe wanted to kill his own son and was using this novel as a way of working through that. Stuck in Neutral is a weird book to read--it's essentially a happy-go-lucky boy named Shawn wondering if his dad's going to murder him for however many pages it is. (I read it on Futurebook, so all I can tell you is that it's a very short book, and 20% of it is made up of non-novel content.) Shawn has severe cerebral palsy that causes seizures and ensures he has no control over his body. He cannot express himself, verbally or nonverbally, and he requires significant assistance from others each d Stuck in Neutral is a weird book to read--it's essentially a happy-go-lucky boy named Shawn wondering if his dad's going to murder him for however many pages it is. (I read it on Futurebook, so all I can tell you is that it's a very short book, and 20% of it is made up of non-novel content.) Shawn has severe cerebral palsy that causes seizures and ensures he has no control over his body. He cannot express himself, verbally or nonverbally, and he requires significant assistance from others each day. The first, most glaring thing about this book is the fact that it presents as a serious discussion the question "Should we euthanize people without their consent because it looks from the outside like their lives aren't worth living?" Perhaps it's the Catholic in me, but this feels like a no-brainer. The fact that Shawn cannot live without assistance doesn't make his life invalid, and I don't think it's reasonable to suggest euthanizing him when he has no ability to express an opinion on the matter. I find it disturbing that it's even a question, let alone an award-winning issue novel. There are valid questions to ask about quality of life for severely disabled children and their family members, and I think books exploring those subjects could be great, insightful reads. However, this book focuses squarely on "should we kill this high-schooler because he needs significant assistance in his day-to-day life?" It feels reductionist to me that this is the book's overwhelming question, and while it gets across Shawn's father's inability to watch his son go through life with cerebral palsy, it says nothing beyond that. For instance, Shawn's mother is given little characterization; as Shawn's primary caregiver, however, she likely experiences struggles that are completely ignored within the text. The fact that she would be the person advocating for Shawn to his school and to government agencies they might receive assistance from isn't mentioned, nor is the stress of being a single mother to three children, one of whom will never be able to live independently. But there are other problems with the book, too, mostly with Shawn's characterization. There were times when his narration was jarring. For instance, it seemed like a strange choice to have a boy who has never been able to express a feeling to someone else to say (emphasis mine), "I'm the youngest kid in our family, three years younger than my sister, Cindy, and two years younger than my brother, Paul, who, although I'd hate for them to know I admitted it, are pretty cool for a brother and sister." Trueman is presumably trying to get across that Shawn is a normal kid inside, regardless of his appearance, but I think he accomplishes that far more effectively in other places. He also has an eidetic memory, which I don't feel added much to the book but presumably provided the inspiration for Sharon M. Draper to give her similarly disabled main character the same trait in Out of My Mind. Both Shawn and the main character in Draper's book (which is also a book about a character with cerebral palsy, written by the parent of a child with a disability) set themselves apart from their peers in special education as being a sort of secret genius. I really dislike that about both books; it seems to suggest that disabled children aren't worth writing about unless they have traits that "make up for" the fact that they're disabled. I didn’t know that this book was so controversial until I Googled it. People actually believe that this novel is proof that the author wants to murder his disabled son. I’m sorry, but that seems idiotic. If authors were as twisted as their characters, Stephen King would have been in prison 30 years ago. Books can’t be written in a vacuum. All authors are inspired by real life. Just because there are similarities between this book and the author’s life doesn’t mean that somebody’s going to get mu I didn’t know that this book was so controversial until I Googled it. People actually believe that this novel is proof that the author wants to murder his disabled son. I’m sorry, but that seems idiotic. If authors were as twisted as their characters, Stephen King would have been in prison 30 years ago. Books can’t be written in a vacuum. All authors are inspired by real life. Just because there are similarities between this book and the author’s life doesn’t mean that somebody’s going to get murdered. Be reasonable, people. Okay. Stuck in Neutral is the story of fourteen-year-old Shawn, a boy with cerebral palsy. Shawn has no control over his body. He can’t move or speak. Since he has no way to communicate, he’s trapped inside his own head. Shawn’s father worries that Shawn’s condition is causing him pain that he’s unable to express. As Shawn’s father becomes more obsessed with his son’s possible pain, Shawn starts to wonder if his father is planning on killing him. Shawn’s life is not completely miserable. He acknowledges that his medical problem has some benefits. For example, he gets to see his sister’s friends change clothes at a sleepover because they don’t think he can understand what’s going on. Additionally, his seizures cause a dreamlike, floating feeling that makes him calm and happy. He’s taught himself to enjoy the little things in life. Shawn’s sense of humor and positive attitude help tone down the intensity of the book. I actually had a lot of fun reading it. My only big criticism is that this novel is very short. My copy is only about 115 pages. I think it could have benefitted from being longer. Shawn doesn’t have an action-packed existence, but I wondered about the other people in his life. Shawn’s mother is his full-time caregiver, but we barely see her. He has a brother and sister who we don't learn much about. I also had mixed feelings about Shawn’s acceptance of his father’s (possible) murder plan. Realistically, Shawn has no choice but to accept it. He can’t communicate, and he can’t fight. If his father decides to murder him, he’s going to die, but I think that Shawn’s suspicion of the murder plot should have caused more angst. Stuck in Neutral was first published in 2001 and was a major influence in the teen “problem novel” genre. It won awards and got a lot of people talking. It’s a brave and thought-provoking book. It confronts taboo subjects that make some readers uncomfortable, such as euthanasia and the rights of severely disabled children and their parents. Even though these topics are unpleasant to discuss, they’re important. This book made me think about how able-bodied people project their feelings onto the severely disabled. I don’t know any severely disabled people in real life, so I’ve never thought about this before. Shawn’s father sees Shawn’s seizures and assumes that they’re painful. He assumes that Shawn’s cerebral palsy prevents him from enjoying life. In reality, Shawn isn’t bothered by his seizures, and he has developed a unique way of connecting to the world. This book shows that you can’t make assumptions about a person. Just because someone is disabled doesn’t mean that he/she is suffering. Incredible book! Terry Trueman is a REAL author. Stuck in neutral is a short but moving book. although this book might not be the hardest or the longest the meaning of this book is very strong. this book can be read by adults, teenagers and children. this book is for all ages becuase it shows us the importance of life to a person that you may think is useless. the book is about a young boy named Shawn who has cerebral palsy. although many people think that he can't do anything or think for himself they are wrong. Shawn is actually a very smar Stuck in neutral is a short but moving book. although this book might not be the hardest or the longest the meaning of this book is very strong. this book can be read by adults, teenagers and children. this book is for all ages becuase it shows us the importance of life to a person that you may think is useless. the book is about a young boy named Shawn who has cerebral palsy. although many people think that he can't do anything or think for himself they are wrong. Shawn is actually a very smart boy but because of his condition many people don't see it. His father loves him a lot. His father doesn't like to see shawn this way and many times he thinks about killing him but never does. Shawn knows that his father wants to kill him but can't do anything about it. on the last page of the book we have shawn and his father alone and in the fathers hand there is a pillow. it osn't clear wether the father kills shawn or if he doesn't. A fantastic book that really makes you think! Shawn has cerebral palsy and can't communicate with anyone. Told from his viewpoint, the reader learns about Shawn's feelings, dreams, and also his fear that his father wants to kill him. I couldn't put it down and read it in one sitting. I will be recommending this one to any and all. My Name is Shawn McDaniel. I think my father is planning to kill me. In a phenomenally personal story Terry Trueman takes us into the mind of a profoundly, developmentally disabled cerebral palsy sufferer who's also a quirky, insightful, vibrantly alive 14 year old. However this kid is pretty much input only. Who can tell what goes on in the mind of a child who cannot even control his own eye blinks? While the protagonist in this story is unable to communicate with anyone in his My Name is Shawn McDaniel. While the protagonist in this story is unable to communicate with anyone in his world , this book gives us an inner monologue that shows us a unique individual who's glad to be alive and who is relishing each and every new life experience with the wonder of a child (and sometimes that of a horny kid). This kid's inner monologue connects with the reader on a level that books seldom do. Written by the father of just such a boy, this book may even afflict the reader a bit too, only the body parts that the sympathetic reader will be unable to control are the tear ducts. And yet for the most part this is NOT a sad, maudlin, tear-jerker of a book. One really needs to read this oneself to experience the full effect but even the visceral dread that one experiences as the kid describes his fear that his father may end his life in order to spare him continued suffering is only accentuated by the feel of having so few pages remaining unread in the book. This book can have a profound impact on you if you have any emotional connection to someone with a disability. I really liked the first person narration from a teenage boy whose disability has left him mute and with no way to communicate with anyone or anything. The ending of this book can be highly emotional and due to the "possible" outcome of the end I would reccommend a dialogue and discussion if teenagers are reading it. I thought this book was amazing when I first read it, and am so utterly horrified at myself now. I really liked the book, Stuck In Neutral, a lot. It was one of the best books that I have ever read. I will definitely rate this book five stars on Goodreads, because it was one of the best books I have ever read. It was also a great way to learn the perspective from someone who has a mental condition. I hope to read the second book to learn more about main character, Shawn, and what happens to him later in his life. 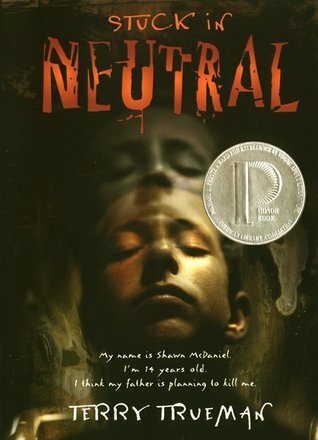 The book, Stuck In Neutral, was a great story that makes the reader think more about what it is like having mental conditions, such as the ones Shawn has. The book takes place in Seattle, at Shawn's house. Shawn is a retarded kid that knows more than anyone would ever think. He just cannot show any signs of not being a complete vegetable, and it makes it hard for him. He still has feelings like a normal human being. It also makes it harder on the reader to know both sides and know that he is okay. This term is called dramatic irony when the reader or characters know something that the main character does not know. In the book, the reader knows that Shawn can hear and understand everything going on, but his dad does not know. This is why Shawn's dad wants to end his son's suffering that does not exist. He is a smart kid stuck in a useless body, and that makes the reader feel bad for him. It also makes the reader think of other kids with similar conditions. He can understand most things very well, but cannot communicate with anyone to prove he is okay. The whole book is from Shawn's point of view, as he tells the reader about how it is living this life. The main character of the book is Shawn. He's a 14 year old boy with a mental condition of being a retard. He is very smart, but nobody knows because he cannot talk or show any sign of understanding. Shawn has seizures and his family thinks they are horrible, but he actually likes them. He said that it takes him away from all the bad things he thinks about during the day. Throughout the whole book Shawn says he will be flying or soaring in the sky, as he knows his dad talks about ending his suffering. He still is not sure if he should end his son's life or not. He loves his son so much and that's why his dad is questioning if he should kill him throughout the book. Shawn's dad is a famous person who is always on the news and had wrote a famous poem about Shawn. He is very loving towards Shawn, but he does not know how to help. Shawn's dad has a hard time controlling his emotions throughout the book and does not know what to do. This is why his dad wants to end Shawn's suffering, not knowing that Shawn is truly ok. The book takes place in Seattle, but that's not very important to the story. The book is all from Shawn’s perspective in his house, and stories of his life. He sits at home throughout the whole book, because he is stuck in a wheelchair. The book takes place in a modern day time frame, because Shawn talks about his siblings learning in school. Shawn also talks about the news he sees and hears on television. Shawn also what explains things he sees and describes throughout the book. He learns about what different kinds of phrases mean. The book is all from Shawn's point of view, so there is a lot of describing what his life is like and what is around him. I would recommend this book to any guy or girl who likes to read about realistic fiction. I finished this book very quickly, because I was very interested in the topic. Any guy or girl would like to read this book if he or she wants a short, great book. I would recommend this book to any guy or girl in middle school and up, because a younger child may not understand as well as an older kid. Personal Response: I liked Stuck In Neutral by Terry Trueman. It kept me interested and made me guess what the outcome was going to be. Before I read the book, I thought parents always enjoyed their kids presence, but learned that not all parents do. I liked that Shawn always tried to do his best, even though he had to overcome some obstacles. Plot : The book was about a boy named Shawn who had Cerebral Palsy. His dad, Sydney, left after Shawn was born, because of his seizures and cerebral palsy. Personal Response: I liked Stuck In Neutral by Terry Trueman. It kept me interested and made me guess what the outcome was going to be. Before I read the book, I thought parents always enjoyed their kids presence, but learned that not all parents do. I liked that Shawn always tried to do his best, even though he had to overcome some obstacles. Plot : The book was about a boy named Shawn who had Cerebral Palsy. His dad, Sydney, left after Shawn was born, because of his seizures and cerebral palsy. His parents got divorced when Shawn was 4. Shawn felt like it was his fault. Shawn was taken care of by his mom. He was not able to take care of himself. He could not communicate, but he was very intelligent. His dad won a Pulitzer Prize for writing a poem about Shawn's disability. After he won the prize, he started writing a book that described the struggles of dealing with the disadvantages of dealing with a handicapped son. He went on a talk show and met a man who had killed his handicapped son. Shawn’s dad related to this man. Shawn started thinking that his dad wanted to end his life, so he would not suffer any more. Shawn could not communicate with his dad to tell him he wanted to live. The books ended when Shawn had a seizure and his dad was holding a pillow close to Shawn’s face. Shawn was a 14 year old boy with cerebral palsy. He could not walk, talk, or even feed himself without assistance. He had a good attitude and was a positive thinker, until he believed that his father was trying to kill him. Shawn’s mother, Cindy, was the person that watched and took care of Shawn. She helped Shawn with his basic needs. She was very loving and patient. Shawn's Dad, Sydney, struggled dealing with having a disabled son. He worried that Shawn was suffering and thought about taking Shawn’s life. He was a talented writer. Setting: The book took place in Seattle, Washington during modern times. Shawn liked to visit the Seattle Center, especially the Pacific Science Center and the Space Needle. This was important to the plot because when Shawn was at these places he could forget about his cerebral palsy. I liked the book Stuck in Neutral. It gave great detail about how Shawn lived and all of the struggles he had to go through every day. Shawn was probably the smartest person alive, but he could not talk or walk. He was stuck in a wheelchair, and could not make any movement, people thought he was just retarded but he actually remembers everything that has ever happened in his life. In the beginning of the book Stuck in Neutral by Terry Trueman, Shawn seemed like the ordinary kid. He made it sound like he was living the same life as everyone else. Then he started to explain more about himself. He could not walk or talk and he lived his whole life in a wheelchair. Shawn remembered everything that he has ever heard, for example he heard a couple fighting outside his window about five years ago and remembered every word they said. Everything came into his head, but nothing could come out. Shawn had random seizures every day and he could not stop them. He said that they did not hurt him, but everyone else who watched him have one probably thought they did, especially his dad. His dad moved out of the house when Shawn was very young because he could not stand to watch Shawn in pain. It killed his dad a little bit every time. Shawn’s dad did a lot of research to figure out how he could fix what was wrong with his son, but the only answer he got was to kill Shawn. His dad loved him so much he did not care about the consequences, he just could not stand to see his son in pain anymore. The main character in this book was Shawn. He was the one telling the story about his life and how being retarded was the hardest experience anyone could suffer. The only other main character in the book was Shawn’s dad. He loved Shawn so much but he could not stand seeing him in pain. The setting of this book took place in a small town in Washington during the early 2000’s where Shawn had lived his whole life. He remembers going to Seattle on a trip with his family to a museum when he was about five years old. His favorite place to go was the Seattle Pacific Science Center. I would recommend this book for boys and girls age 12 and up. It gave great detail about how hard Shawn’s life was and all the struggles he had to go through every day. I think age 12 would be appropriate for this book because most younger kids do not understand why others are mentally handicapped. Personal Response- I cannot put into words how amazing this story was. The amount of detail made me feel as if I was involved within the story. Shawn had a very interesting life. Terry Truman did a phenomenal job on creating another world. Plot- Shawn McDaniel was a teenage boy with Cerebral Palsy. He had no control over his body, actions, or no way to express his feelings. Due to his mental illness, Shawn suffered from seizures but he had a great ability to remember everything he heard. This ra Personal Response- I cannot put into words how amazing this story was. The amount of detail made me feel as if I was involved within the story. Shawn had a very interesting life. Terry Truman did a phenomenal job on creating another world. Plot- Shawn McDaniel was a teenage boy with Cerebral Palsy. He had no control over his body, actions, or no way to express his feelings. Due to his mental illness, Shawn suffered from seizures but he had a great ability to remember everything he heard. This ranged from the pattern of raindrops falling to conversations his family had while he was around them. Shawn's father, Sydney McDaniel, was an award winning poet. When Shawn and his parents found out about his condition, his father wrote a poem about him which became very famous. This poem expressed how Shawn's father felt. He was upset, hurt, angry, and confused about his son's condition. Sydney left his family when he became fed up with not being able to know anything about how his son felt. Shawn’s dad was tired of seeing his son suffer. Characterization- Shawn was the main character of this story. Shawn also lived with his mother and two siblings, Cindy who was 17, and Paul who was 16. Shawn’s mother was his primary caregiver; she fed him his meals and took care of his needs every day. His father left shortly after Shawn was born because he couldn’t handle seeing his son in pain, particularly watching Shawn suffer through his seizures. Shawn had anywhere from six to twelve grand mal seizures each day. While these seizures were painful when he was younger, Shawn had adapted to them and found out he could leave his body during the seizures, and gained a sense of freedom as he floated around the greater Seattle. Thus, despite his father’s revulsion toward the seizures, Shawn loved them. Setting- The setting of this story was in Seattle, Washington. Shawn did not go to school because he was unable to function. Shawn’s dad traveled around a lot. Shawn watched his dad talk on a couple of talk shows, which shifted the setting perspective for a little bit. The setting was important to the story, because this was where Shawn’s life was. This book took place in modern day 21st century, because of all of the medical needs were present in Shawn’s life. The ability for Shawn to live in the 21st century has helped him experience the things he had experienced. Theme- The major theme of this story was quality of life. This boy had a special gift, but he could not share or enjoy it with the world because of his medical condition. The reader can see this theme in the book when Shawn thought about being normal, and wanted to take part in activities kids his age take part in. Shawn is trapped within his own body. As a severely disabled teen who is unable to communicate in any way, most people assume that Shawn is an idiot incapable of learning; yet this is far from the truth. Shawn remembers everything that anyone has ever said to or around him. And now he is beginning to fear that his father is planning to kill him. This was truly an interesting look into what might be the life of someone like Shawn. It is easy to assume that we know or understand someone simply beca Shawn is trapped within his own body. As a severely disabled teen who is unable to communicate in any way, most people assume that Shawn is an idiot incapable of learning; yet this is far from the truth. Shawn remembers everything that anyone has ever said to or around him. And now he is beginning to fear that his father is planning to kill him. This was truly an interesting look into what might be the life of someone like Shawn. It is easy to assume that we know or understand someone simply because of their ability (or inability) to communicate with us. Who knows how many incredibly intelligent people are trapped behind disability. This book has rendered me speechless. I'm glad I read it and I enjoyed reading it, but I have no idea how to rate it. It's the perfect pick for a book club! Opinions would vary, I'm sure, which would make for lively discussion. This is an intense story from the point of view of a teenage boy trapped inside his body by cerebral palsy. No one, including his family, knows he is aware and intelligent. It was disturbing to imagine what it would be like to be that alone. Was a very intense and interesting book. I always wanted to keep reading and it is a book I would not usually pick to read but it was very good. Small but very well formed, I can see why this book won prizes when it first came out. Quick read on a topic that I’ve not read much about... the relationships in a family with a son who has profound physical handicaps. The realistic fiction novel Stuck in Neutral by Terry Trueman really dives into the depths of major physical and mental disability. The story discusses the daily life of a 14-year-old boy with severe cerebral palsy. The main character of is a boy named Shawn Mcdaniels. Shawn has very severe cerebral palsy. However, Shawn can recall any dialogue he has ever heard. Anything any ad, any song he's ever heard. Now moving on Shawn also has a Family. A mom who helps him do everything. A bother who is ve The realistic fiction novel Stuck in Neutral by Terry Trueman really dives into the depths of major physical and mental disability. The story discusses the daily life of a 14-year-old boy with severe cerebral palsy. The main character of is a boy named Shawn Mcdaniels. Shawn has very severe cerebral palsy. However, Shawn can recall any dialogue he has ever heard. Anything any ad, any song he's ever heard. Now moving on Shawn also has a Family. A mom who helps him do everything. A bother who is very protective of him and a sister which we don't know much about. However, the most important was his father. His father is a well-known author and is divorced from the rest of the family. The thing is that lately, his father has been having a bizarre attitude towards Shwan. For example, having a fit of rage and threatening Shwan. However, the most disturbing thing is that he starts writing a book about a man who killed his two-year-old son with cerebral palsy. Also to interview the man and agrees with and even goes on national TV to defend this man. Which left Shawn very troubled.